You might be considering one of these scroll knobs if you've been dabbling with animation and 3D design on a Mac. Sadly, if you're into any other type of design then it's not for you. 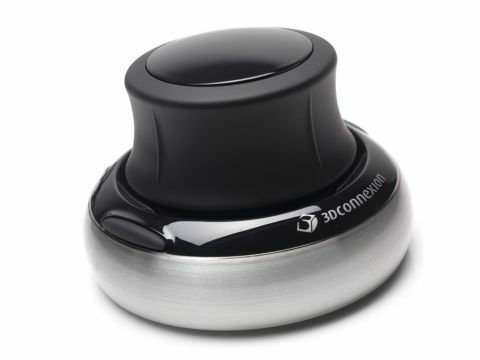 3Dconnexion is a Logitech subsidiary, and this is the latest version of this 3D controller. The only big difference between this version and previous versions is that this update feels much heavier and more solid. It's a hefty item with a rubber ring under the base, so there's no chance at all of it sliding around your desk while you use it. Functionally, it's identical to previous versions. The large black knob offers six-axis control and can pick up twists, four degrees of panning (forward/back and left/right) and up/down pulls and pushes. It comes into its own in 3D environments, and plug-ins are included for all the most recent versions of 3ds Max and Maya. With SpaceNavigator installed, navigation becomes a lot more intuitive because you can twist, pull and pan your way to the orientation you want. Although it takes some getting used to initially, once you've spent some time with it, it becomes second nature. As a tool for 3D it's great, but outside 3D software packages it doesn't have much appeal. Unfortunately, support for other apps is patchy to non-existent. There's an Adobe Acrobat plug-in, but it doesn't work well in this environment. You can also use it with Google Earth and 3Dconnexion's own picture viewer. But the killer is that there's no support for Adobe Creative Suite and none for web browsing. By ring fencing how you can use the tool and sectioning off areas where you can see it would bring benefits, a trick has been missed. Gamers, designers and even everyday web users could benefit from this unique interface. And although there are two side buttons, the control panel gives you only very minimal programmability.